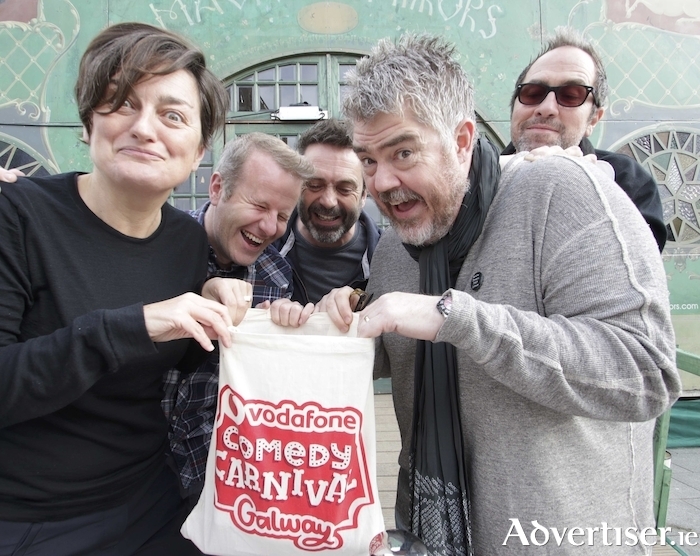 Advertiser.ie - Vodafone Comedy Carnival 2018 - what are you going to see? AFTER JUST two days of the Vodafone Comedy Carnival, all signs point to this year’s being the largest festival of fun to date. Sales are set to surpass 2017's record numbers with queues out the door for most shows so far. Full houses have been reported at most of the first two days, and Dylan Moran, Sean Lock, Jason Byrne, Dermot & Dave, Wild Atlantic Wahey, and two of the three Comedy Club Crawls are already sold out. Your best option, according to the organisers, is to go to the comedy village in Eyre Square and chat to the staff in the kiosk who can guide you through the programme and suggest a show that will suit best. Tickets are still available for Rhys Darby, Al Murray, Reginald D Hunter, Milton Jones, and Joel Dommett; the hour long lunchtime shows in The King's Head Ruby Room from 1pm; and for the afternoon showcases in The Mick Lally Theatre and King's Head at 3pm. Regular visitors The Improv Allstars are back for three special shows, with guests Dermot Whelan, Phill Jupitus, and Joe Rooney. The Dirty Circus return with a new show of burlesque and cabaret. The Mick Lally Theatre is a new addition to the festival this year and hosts three Best of Irish ‘Raw’ shows and a special appearance tonight by Paraic Breathnach with his new show, The Macnas Was On Me. One of the highlights of the festival in recent years has been the Magic Mirrors Spiegeltent and comedy village in Eyre Square, which adds enormously to the festival vibe. The organisers have publicly thanked the city councillors and officials "whose foresight in recent years has given us not just the Christmas market, but now the biggest comedy festival in Ireland. This is an excellent use of Eyre Square and massively contributes to tourists’ perception of our city as a vibrant artistic space with quality entertainment always on offer." A second venue in Eyre Square this year is The Yurt, which will see Republic of Telly's Kevin McGahern interview Milton Jones, Phill Jupitus, and Reginald D Hunter about life on the road, comedy inspiration, and more. The Yurt will also host solo shows from Porky the Poet, the alter ego of Phill Jupitus [pictured above wioth Tanya Lee Davis]. Indeed Porky also plays support to Phill in his one man show Juplicity next Saturday in The Mick Lally Theatre at 8pm. For those seeking something a little different, the festival is well supplied with avant-garde acts, such as The Cuban Brothers and Oh My God It’s The Church in the Spiegeltent this Thursday. On Saturday and Sunday, see Tanya Lee Davis, who is only 3.5 feet tall, but who is a huge talent. As she says herself, she’s like the Ferrari of comedy – low to the ground and kind of racy. The king of all left field performers is surely Belfast's Paul Currie. Pauls’ Hot Donkey won the Best Show at the Comedian’s Choice Awards in Edinburgh. The only people allowed vote in these awards are performers and they know a genuine artist when they see one. This is comedy from another dimension. It is audience interaction on a different scale. It is also, by far, the funniest hour you can spend in one man’s company. With 120+ performers playing in 18 venues over seven days, there is something for everyone - even for those who are only mild comedy fans. Most events are mixed bill shows where four/five comedians, along with an MC, perform for 20 minutes each. If one of them happens not to float your boat, there will be another along shortly. Most of the mixed bills are held in the Spiegeltent. That same venue hosts one little gem on Sunday before the Macnas parade, entitled Best of Irish. It will feature more than a dozen Irish comics performing their best material in short sets, and will finish just in time for the Macnas Halloween shenanigans.